Could this be the future of VW’s crossover/SUV lineup? The 2016 Geneva Motor Show is shaping up to be one of Volkswagen’s most important auto shows. As the German automaker tries to recover from the worst scandal to hit the auto industry in recent years, it’s stepping up with a handful of important models that will all play a part in stirring up what it calls the “New Volkswagen.” One of these models is the T-Cross Breeze, a preview version of an entry-level crossover that will sit below the Tiguan in the company’s SUV lineup. The concept will arrive in Geneva with a drop-top configuration á la the Nissan Murano CrossCabriolet and the Range Rover Evoque Convertible. It’s a bold move to package the T-Cross like this, but make no mistake, whatever model comes out of the concept will be packaged in a more traditional matter. 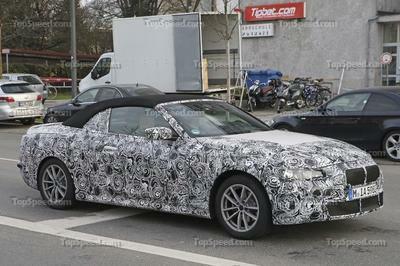 A drop-top could be in the cards, but it’s too early to tell if VW is prepared to take that route, interesting as it sounds. For now, treat the T-Cross Breeze like any other concept, albeit one that could potentially have a more important role in the future. Volkswagen made it clear that the T-Cross Breeze serves as a “teaser” for its first compact SUV and more importantly, the first hint of a new design language that would usher in a new era for the company. First, let’s start with the measurements. The T-Cross Breeze measures 162.7 inches long, 70.8 inches wide, and 61.5 inches high when the roof is in proper position. The 101-inch wheelbase suggests short body overhangs, thus resulting in the sporty proportions of the concept. 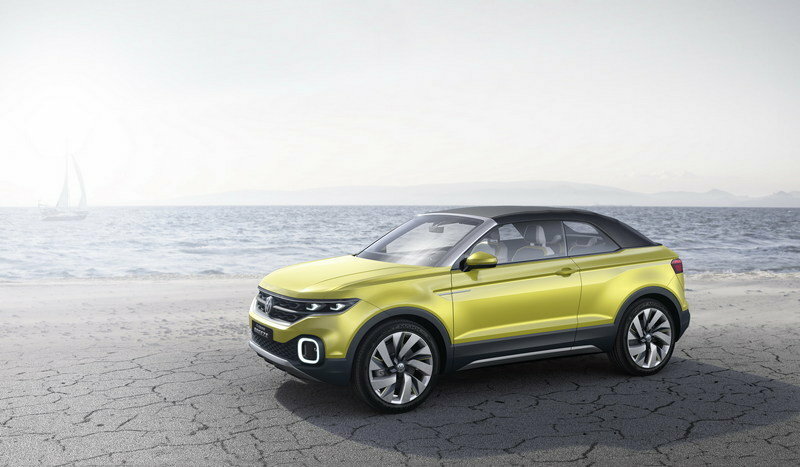 Visually, there are a number of similarities between the T-Cross and the T-Roc Concept that Volkswagen introduced at the 2014 Geneva Motor Show. The wide radiator grille and narrow headlights are close to identical. The front bumper of the T-Cross is more refined and the foglight are square in the T-Cross as opposed to being round on the T-Roc. The former does have LED rings around its foglight whereas the latter doesn’t. The T-Cross also has an aluminum underbody protection in the front. To the side, the concept’s profile is largely dominated by pair of character lines, including one that runs straight from the front wheel arches, through the door handles, and all the way to the taillights. Aluminum side sills and a set of 19-inch aluminum-alloy wheels are the other distinctive features of this side of the T-Cross. The rear end is pretty straightforward. It’s got a wide trunk lid with its own set of integrated LED taillights. The same aluminum underbody protection can also be found here. From a cosmetic standpoint, the T-Cross Breeze largely features a unique Summer Green Metallic paint finish. A Deep Teal shade was used on certain parts of the car to create a nice contrast while the soft top, black roof adds the final touch to what looks like an interesting take on VW’s future entry-level CUV. The interior is always the wild card in any concept because it’s the one part of the car that designers can go crazy on without having to answer to today’s technological limitations. To Volkswagen’s credit, it resisted from going full “Jetsons” on the cabin of the T-Cross. There are some elements like the 300-watt Beats Audio sound system with a subwoofer integrated in the center console that has a place in today’s VW models. The four sports seats look sportier than anything we’ve seen out of Volkswagen, but they too aren’t too futuristic to dismiss being applied into the new wave of models the German automaker plans to release in the next few years. 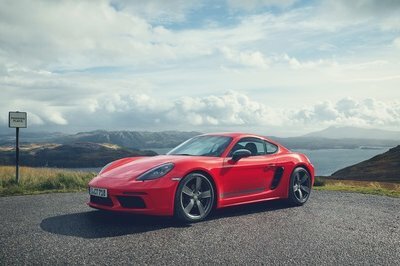 Speaking of the seats, VW says that they come with the same knit-type material used by the likes of Nike and Adidas on some of their sneakers. How’s that for cross-industry adaptation? On the flip side, the designer’s decision to adopt an Active Info Display for its digital instrument cluster evokes similarities to what it did with the BUDD-e Concept that made its debut at the 2016 Consumer Electronics Show in January. The interactive HMI is being touted as an integral part of next-gen VW models, and the version on the T-Cross is a little more subdued than the one found on the BUDD-e. It still has that same two-screen layout but it’s not as ostentatious as the BUDD-e’s version. This could suggest that this is the version that’s closer to the production version that VW plans to release soon. The absence of buttons also plays into the company’s goal to build vehicles that rely exclusively on a new control interface that will be gesture-controlled. The T-Cross acts as the guinea pig of sorts in this regard because it still has a few switches in it, including the control stalk, power windows, and controls for the roof. Soon enough, VW hopes to completely make its cabins buttons-free so the T-Cross carries that role of introducing that important shift. Other important technologies are also being introduced in the T-Cross Breeze. Arguably the most useful and functional of these techs is the predictive driving profile selector. This feature allows the car read the topography of its given route while working in concert with the navigation system. Depending on what it finds, it can automatically make technical changes to the car’s engine, damping, or steering. The T-Cross Breeze Concept has a powertrain that’s neither hybrid nor electric. Instead, it’s powered by the smallest of small engines: a turbocharged 1.0-liter inline three-cylinder that produces 109 horsepower and 129 pound-feet of torque. All that power is sent through a seven-speed, dual-clutch automatic transmission that turns the two front wheels. Don’t expect it to set any speed records anytime soon considering its output only allows it to sprint from 0 to 62 mph in 10.3 seconds. Top speed is at 117 mph, which is actually pretty surprising. 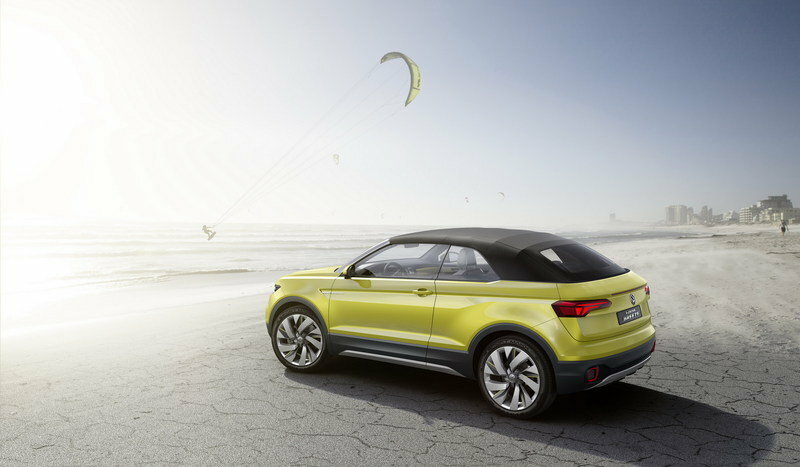 According to Volkswagen, the crossover concept would be able to carry a fuel efficiency rating of 47 mpg. 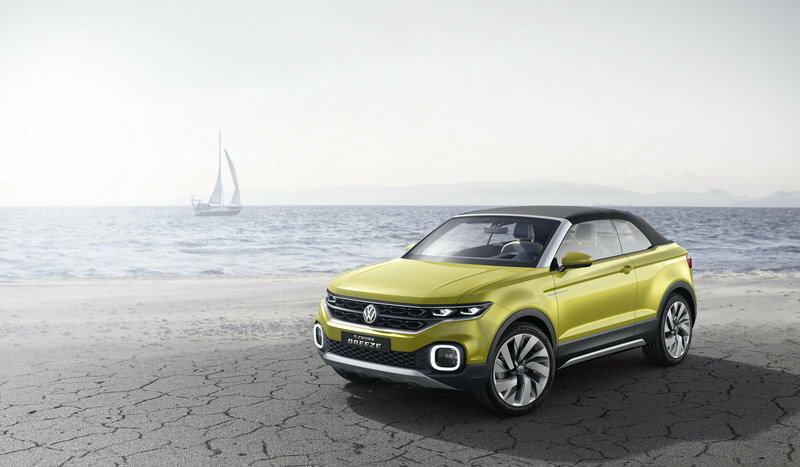 From what it looks and sounds like, the Volkswagen T-Cross Breeze is one of the more important concepts VW has released in recent years. That says a lot for what could conceivably be a preview for one of the most affordable production models Volkswagen will have in its massive lineup. But the T-Cross is important for a number of reasons. First, the company said that it will lay the ground work for a newly developed SUV model series. 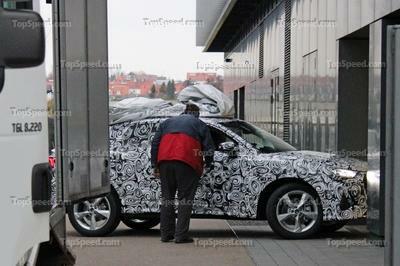 Second, the model will, for all intents and purposes, try to cover both the compact car and crossover segments. It’s hybrid in a different sense. Last and most importantly, it’s being touted as one of the first hints of a new Volkswagen brand that presumably wants to start a new chapter in its history as it tries to move on from one of its most turbulent times. For better or worse, all of that is on the shoulders of the T-Cross. No pressure, right? A big step up in looks compared to present-day VW models. How much of the interior will be adapted into the production model? The new T-Cross Breeze will take center stage on the Volkswagen stand at the 86th Geneva Motor Show. Dr Herbert Diess, the Chairman of the Board of Management Volkswagen Brand says: "Our T-Cross Breeze is the first open-top SUV in its class and, at the same time, an affordable, cheeky cabriolet with a raised seating position that gives you a perfect view." This concept underlines that Volkswagen is making mobility more of an experience than ever before. Herbert Diess: "At the moment the T-Cross Breeze is purely a concept, but we can well imagine putting such a convertible on the market as a production model. This is an affordable fun car that is also entirely suitable for everyday use—it’s a genuine ’People’s Car’." The concept car, which is equipped with an 81 kW/110 PS 1.0 liter TSI turbocharged and direct-injection gasoline engine) gives a glimpse at a new model series. Klaus Bischoff, Head of Design for the Volkswagen Brand, explains: "The T-Cross Breeze is a teaser for the most compact sport utility vehicle that Volkswagen plans to make – and the nucleus of a new SUV and convertible design in the compact sector." "The T-Cross Breeze reflects the new start for our brand", adds Bischoff. "We want to stir enthusiasm for ’New Volkswagen’. In this instance we are doing that with an unprecedented vehicle concept in this class; a completely redesigned cockpit and design that is equally crisp and expressive." In future, Volkswagen aims to offer an exciting SUV in every relevant segment. It will start this ambitious product onslaught with the market launch of the new Tiguan, which begins at the end of April in Germany and in early May in the rest of Europe. On the major overseas markets the new Tiguan will also be available with an extended wheelbase. This will be followed by a new mid-size SUV for the US and China as well as the well-known premium segment Touareg sport utility vehicle. Below the Tiguan, two new SUV models will make their debut: in the Golf class there will be an SUV that is similar to the T-Roc concept car, while the T-Cross Breeze moves into the Polo size range. The T-Cross Breeze uses a highly efficient 1.0-liter turbocharged and direct-injection TSI gasoline engine (TSI) that has a stop-start system and recuperation mode. The 81 kW/110 PS engine also makes 175 Nm (129 lb-ft) of torque from just 1,500 rpm. The TSI engine drives the front wheels via a 7-speed DSG dual-clutch automatic gearbox. Thus equipped, the 1,250 kg (2,756 lb) SUV convertible sprints from 0 to 62 mph in just 10.3 seconds and reaches a top speed of 117 mph. Fuel consumption and CO2 values are also excellent: 5.0 l/100 km (47 mpg) and 115 g/km. In combination with the 10.6-gallon fuel tank, the concept car has a theoretical range of 497 miles – easily enough to drive from Geneva to Cannes or Venice on a single tank of fuel. At a length of 4,133 mm (162.7 in), the T-Cross Breeze is slightly longer than a CrossPolo. It boasts a long wheelbase of 2,565 mm (101.0 in), resulting in short body overhangs, thereby guaranteeing sporty proportions. Excluding the door mirrors, the concept car is 1,798 mm (70.8 in) wide – significantly up on existing cars in the Polo class – while the passengers in the T-Cross Breeze also sit considerably higher up. The vehicle is exactly 1,563 mm (61.5 in) high when the soft top is closed. The brand’s unmistakable design DNA ensures that each model can immediately be recognised as a Volkswagen, even when you can’t see the VW logo. The design of the new T-Cross Breeze also underlines the fact that each series and vehicle genre is perceived as completely independent within the brand. 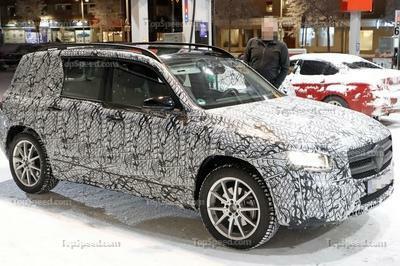 The new Tiguan, set to launch this spring, is the first production model to sport the new, authentic, SUV design. 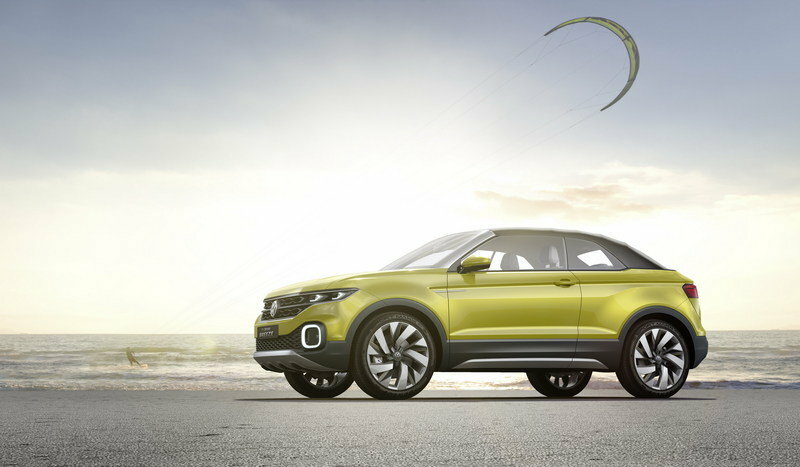 The T-Cross Breeze concept will follow this charismatic style, while at the same time clearly demonstrating the fact that it is an independent SUV series. Take the front end, for example: here the T-Cross Breeze is characterized by a remarkably wide radiator grille and narrow headlights. These details form the new, characteristic face of this most compact SUV. The distinctive LED daytime running light signature, combined with delicate arcs of light under the LED headlights and large LED rings around the foglights, underline the independent design of this small SUV. The side profile is also very distinctive. A striking example of the independence of each of the new SUV series is the double character line. Its bottom edge does not, in this case – and in contrast to the Tiguan, for instance – run straight around the car, but instead rises over the rear wheel. Another feature that characterises the side profile is, of course, the wheels. The 19-inch aluminium-alloy wheels feature a spiral design that is individualized around the hub by colorful, star-shaped plastic clasps. The rear end of the convertible SUV, meanwhile, is dominated by the extremely wide trunklid with integrated LED taillights. The lid opens up to reveal a trunk that is very easy to load, with a volume of nearly 10.6 cubic feet. The T-Cross Breeze is painted a warm shade of green called "Summer Green Metallic", with the wheelarch extensions, radiator grille and the lower sections of the side panels and the bumpers finished in a cool, contrasting dark plastic ("Deep Teal"). All of the visible aluminum parts of the body – such as the windshield frame, the underbody protection at the front and rear and the lower side sills – have a sandblasted finish. The soft top comes in black. Volkswagen’s interiors are currently making quantum leaps. The designers concentrated on what really matters: creating a new spatial experience and completely redesigning the driver’s cockpit, making use of next-generation human-machine interface (HMI) and developing an entirely new control interface that, one day, will completely do away with buttons and switches. This is an early glimpse at where production models are heading in the medium-term. Volkswagen has implemented an ergonomic concept with almost no buttons on board the T-Cross Breeze. 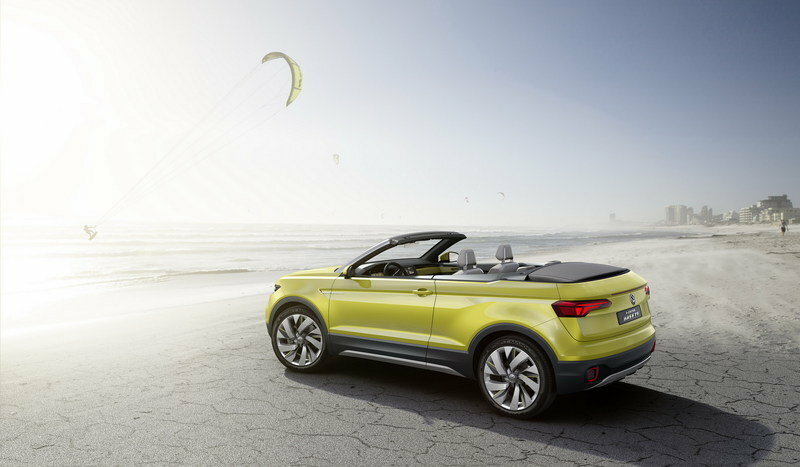 The convertible SUV builds the conceptual bridge to the BUDD-e, which debuted at CES in Las Vegas in January. With the exception of the control stalk, the power window switches and the buttons for opening and closing the soft top, all of the controls in the T-Cross Breeze are touch-sensitive surfaces or executed as completely new "by-wire" solutions. Gesture control also forms an integral part of the operating interface. The new HMI, with its coupled displays, is detached from the dashboard in a style similar to that of the zero-emissions BUDD-e – this is the cockpit of the future. Last, but not least, it is apparent that elements that were formerly purely functional, such as the air vents, now merge with the contours of the interior. The design language and color of the interior forges a link to the expressive exterior. The dashpad and the outer areas of the center console radiate in a fresh "Summer Green Soft" special-effect paint. In contrast to this are the dark surfaces in the interior; the trim is also "Deep Teal", like the exterior. Elements such as the armrests and door handles, the rear section of the stylish free-floating center console and the seat backs, meanwhile, are finished in a light "Ceramique" color. The precision of all the edges is emphasized by the combination of sandblasted and high-gloss surfaces. The materials break new ground, too: just like high-tech sports shoes, parts of the seating are form fashioned, colored (in "Deep Teal") and "knit" in 3D, creating the covers of the inner side support seating surfaces in a single piece, using materials such as special polyamide hybrid fibres that are extremely durable and resistant to deformation. The interactive HMI offers a glimpse at what the next generation of Volkswagen vehicles will look like. With the T-Cross-Breeze, Volkswagen has transferred the visionary system showcased in the BUDD-e to the compact class. This consists of two physically separate screens that blend optically and functionally into one large surface: the Active Info Display as a freely programmable instrument panel in front of the driver, and the Head Unit, which serves as the screen of the infotainment system on the center console. These two screens form a single functional entity. Active Info Display. Digitalization of the instruments is opening up a whole new spectrum of graphic and interactive possibilities. Volkswagen calls this new generation of digital instrumentation the Active Info Display. The graphic environment in the T-Cross Breeze displays the driving information on a completely new, three-dimensional, animated display. These modern, stylish graphic panels can be freely programed by the developers and make a deliberate break with classic round instruments. Drivers can re-configure available information themselves within defined areas, a bit like arranging apps on a smartphone. Depending on the configuration, the display elements change shape, move, shrink or are enlarged. 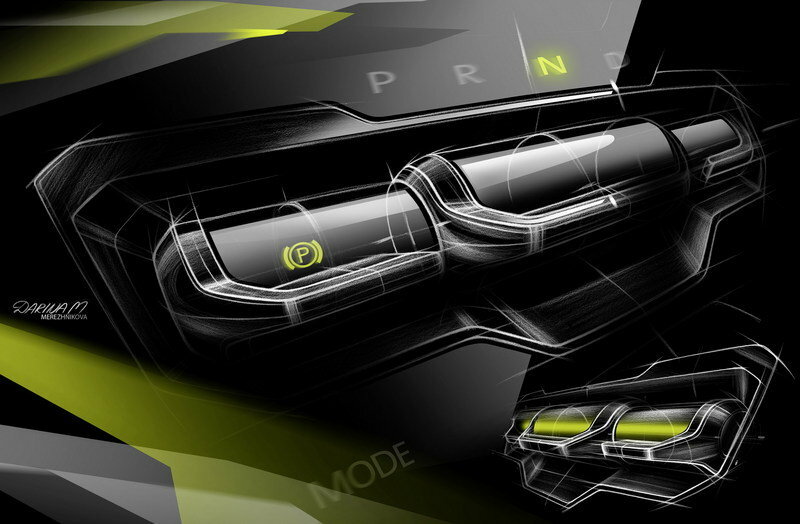 This virtual stage is underlaid with a background consisting of a honeycomb structure, which forms the stylistic common thread running through the entire T-Cross Breeze, as similar elements are also found on the dashboard as well as around the radiator grille, for instance. The robust honeycomb structure was a deliberate choice, as it fits in perfectly with the character of an all-terrain vehicle. The T-Cross Breeze features a predictive driving profile selector, which is closely linked to the navigation system, the frontal camera and various other systems, enabling it to register parameters such as the topography of the route, for example. When the predictive driving profile selector’s Auto function is on, the system reacts automatically and can change the engine, damping or steering characteristics, depending on the driving situation. The Active Info Display also has – as an additional off-road feature – an individual graphical element that is directly linked to the predictive driving profile selector. Using the wide range of sensors on board and by evaluation of geographical data, the car is able to recognize the surface it is driving across when the driving profile selector is in Auto mode. If this happens, the HMI that is linked to the predictive driving profile selector activates a new off-road mode, so that the system messages "TERRAIN IDENTIFIED" and "OFFROAD MODE ACTIVATED" on the driver’s screen. Simultaneously, all of the interactive displays indicate to the driver where and where not this front-wheel drive vehicle can safely move. The "normal" driving information is then moved to the edges of the screen and shrinks to make way and put the emphasis on the off-road content. A topographic map of the immediate vicinity appears in the center of the screen and a stylized depiction of the chassis (tires and shock absorbers) is also displayed. The honeycomb background pattern is transformed into little columns with a hexagonal cross-section, depending on the altitude of the terrain scanned ahead of and beside the T-Cross Breeze to represent the local topography. Areas that should be avoided are highlighted separately. The infotainment system’s central screen (or Head Unit) is freely configurable, with tiles that can be freely rearranged on a predefined grid. Here again, the graphics feature the robust honeycomb structure as a common thread. It is possible, for example, to depict the whole route topographically. You can, for instance, display information about the altitude along the route, or the honeycomb pattern can form a dynamic equalizer. Meanwhile, an inbox displays the last three SMS messages along with a picture of the sender. The other tiles include features such as current weather data and a cover flow for the media library. All of these tiles can, as outlined above, be arranged by the driver or the front seat passenger. Operation of the air-conditioning system is also intuitive: proximity sensors are used to open the required window on the touchscreen, which provides the familiar air-conditioning functions as well as controls for the heated seats. Newly developed features also include a "by wire" gear shifter in the center console. This compact shifter unit is used to operate the DSG dual-clutch automatic gearbox, the electronic parking brake and the DCC adaptive damping (with "Sport", "Normal" and "Comfort" settings). Three elegantly designed glass scroll wheels that are set in chrome are fitted with sensors that enable intuitive operation of these functions. The controls around the glass scroll wheels for the hazard warning lights, the Auto-Hold function, starting and stopping the engine (Keyless Access) and the driving profile switch (Mode) feature touch-sensitive surfaces. BeatsAudio™ sound system. American audio specialist Beats Electronics – founded in 2008 by the rapper Dr. Dre – has made a huge impact on the music scene, primarily with its headphones. Now the Californian company also offers a wide range of audio technologies, including full in-car sound systems. The T-Cross Breeze features such a BeatsAudio™ sound system. The heart of this system is a subwoofer that is integrated in the center console, between the driver and the front seat passenger. The sound system’s 300 Watt, 8-channel amplifier has a digital sound processor (DSP). High-end loudspeakers distributed around the interior deliver crystal-clear sound from the system and a special pattern visually emphasizes the BeatsAudio™ system. The sound system is compatible with the App-Connect suite of connectivity services, meaning that CarPlay™ (Apple), Android Auto™ (Google) or MirrorLink™ can be used to control the playlists of virtually all current smartphones via the T-Cross Breeze’s HMI. Here again, this previews production models of the near future. In parallel to the T-Cross Breeze, the Geneva Motor Show will also see the debut of the comprehensively overhauled up!, featuring a technically similar sound system to the BeatsAudio™ technology shown in the T-Cross Breeze.